Men & Mice Suite Version 7.3 has arrived - and not a minute too soon! Yet considering that it’s jam-packed with goodies such as a brand-new REST API, VMware vRealize Orchestrator plug-in and further support for Windows Server 2016, it was definitely worth the wait. Let’s take a quick peek at what Version 7.3 has in store for our customers. API. In the world of the Internet, it means Application Programming Interface. In the world of the Icelandic language (where Men & Mice has its roots) it means … monkey. Literally. And maybe just as well – a good API, with or without hair, really does seem to make life so much better. 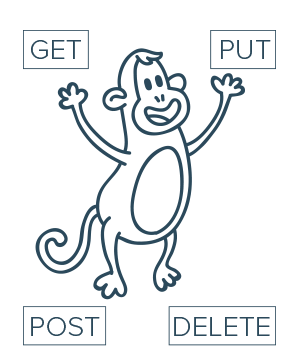 Monkey business or no monkey business, the Men & Mice REST API is sure to offer customers a very welcome extra set of hands - and feet, so to speak – with which to create workflows and write handy scripts for the import and export of data, amongst other things. Used by browsers, REST (Representational State Transfer) is often considered to be the language of the internet. By using HTTP requests to GET, POST, PUT and DELETE data, REST paves the way for two computers to communicate over the internet by one acting as a web server and the other as a web browser. Making use of a stateless protocol, RESTful services exhibit particularly fast performance, reliability and scalability. The Men & Mice REST API includes all the functionality of the existing Men & Mice SOAP API and JSON-RPC, but delivers the added advantages of ease of use, combined with a rich set of tools and support libraries. Additionally REST, as a resource-based instead of a standards-based API, means users gain considerably greater operational flexibility. More information on how to get the most out of REST can be found in the Men & Mice REST API article. Men & Mice takes a further step towards simplifying virtualization by introducing the VMware vRealize Orchestrator plug-in. Designed to integrate seamlessly within the VMware Orchestrator framework, the Men & Mice Suite VMware plug-in allows for fast and efficient provisioning of virtual machines. By plugging into the vRealize Orchestrator, the Men & Mice Suite enables integrated functionality that not only saves time, but also strengthens security, eliminates errors of configuration and ensures improved and continuously synchronized network manageability. Men & Mice Suite support for primary Windows Server 2016 DNS and DHCP features was already included in Version 7.2, released in May 2016. A stand-out feature was support for Response Rate Limiting, which significantly reduces the impact of a Denial of Service (DoS) attack on servers. DANE, or DNS-based Authentication of Named Entities, allows a domain owner to specify in a particular DNS record which certificates authorities are allowed to issue for the domain. The Men & Mice Suite Release Notes provide more detail on other minor improvements and fixes that form part of the Version 7.3 Release. That wraps it up for a quick round-up of all things new and shiny that the Men & Mice Suite Version 7.3 has to offer. If you’d like to jump right in and try out these new features, treat yourself to a Version 7.3 free trial. Coming up in December is the last in our 2016 series of webinars, this time focusing on DNS high availability tools. Don’t forget to sign up!